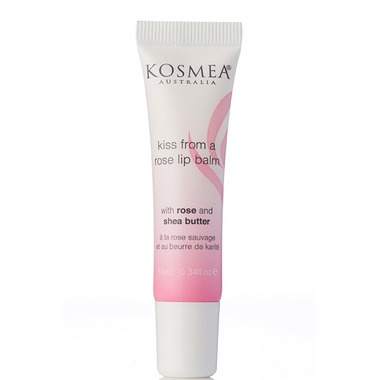 Treat your lips to Kiss from a Rose Lip Balm infused with Kosmea Kiss from a Rose Lip Balm. Directions: Apply everyday to keep lips beautifully soft and moisturized. Ingredients: Helianthus Annuus (Sunflower) Seed Oil*,Ricinus Communis (Castor)Seed Oil*, Cera Alba(Beeswax), ButyrospermumParkii (Shea Butter), Rosa Eglanteria (Rosehip) Seed Oil*, Tocopherol (Vitamin E) Rosa Damascena (Rose) Flower Oil, Geraniol, Citronellol, Eugenol.